Francesco Petrarca, Giovanni Boccaccio and their famous Tuscan predecessor Dante formed the modern Italian language that is spoken in Italy today. The power of their three careers coming one after the other created such a powerful linguistic model that all of Italy followed it even as various regions grumbled about the irritating Tuscans and their pride. The power of Petrarch’s Italian resided in his collection of his own short poems, the sonnets, in the book called Il Canzoniere (The Big Songbook). Within the Canzoniere Petrarch gathered together poems he had been collecting for decades, beautiful small poems, almost all about love. The Canzoniere made Petrarch famous all over Europe. In France, Spain, Germany, Poland, England, Scotland, and Ireland, the example of Petrarch’s poems created new schools of poets dedicated to the Sonnet. It all begins with Petrarch. The great Italian poet and classical scholar Francesco Petrarca was born in Arezzo, a central Italian city south of Florence, in 1304. "I was born to this world in the Via dell' Orto of the city of Arezzo, just at dawn on Monday, July 20, in the thirteen hundred and fourth year of this latest age which takes its name from Jesus Christ, fountain and author of all my hope." (See Photos for a picture of the family house on Via dell' Orto). The family was temporarily living in Arezzo while Petrarch's father suffered the same exile from Florence that had forced Dante into exile. Soon after his birth Petrarch's family was on the move again. From the beginning to the end, Petrarch lived his life in a curious tandem with the life of his famous predecessor, Dante Alighieri. By the time Petrarch achieved real literary fame he began to dream of being the most famous and admired Italian writer – ever! And shadowing his every move and every publication was the reputation of Dante. Always Dante! Petrarch and Boccaccio spent many hours discussing their famous predecessor and although Boccaccio never seemed to resent the unassailable fame of Dante, Petrarch was annoyed by the idea that the greatest Italian poet was named Dante and not Petrarch. The two lives were inextricably bound together as both were from exiled Florentine families whose fortunes might be improved by the arrival of Emperor Henry VII in Italy in 1311. Thus both the Alighieri family in the person of Dante, and the Petrarca family led by Francesco's father were present in Pisa for the visit of the Emperor. If the two famous Italian writers ever met each other it had to be in Pisa in 1311, when Petrarch's father took the family to Pisa to meet the imperial hope of his political party. We know Dante was there too. How interesting it would be to know what Dante Alighieri said to the seven-year old Francesco Petrarca: "Study your books well young man, and you too can grow up to be a great poet!" In 1312, Petrarch's father took the family to France to live in the city of Avignon where the Papal court was located temporarily (temporarily for about sixty years!) while French popes dallied in the Provence sun and delayed their return to Rome. This move of the Tuscan family of Petrarch into the heart of southern French culture was one of the most important experiences of Petrarch's life. It gave him a whole new culture, a new language, to add to his native Tuscan roots and this cultural melting pot produced a complex and tension-filled set of loyalties that ultimately provided him with insights that were at the heart of his totally unique cultural vision that he formed in his writings. This tension between his Tuscan Italian self and the new French Petrarch of these youthful days was also one of the most important reasons that Petrarch later made such extraordinary intellectual leaps. And it was this unique personal story of Francesco Petrarch that lead directly to the Renaissance itself. 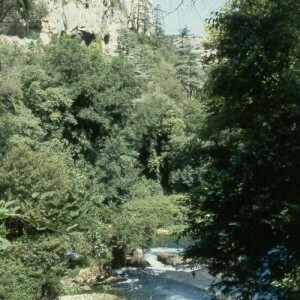 Petrarchs' youth was lived in France and in French. He went to school in Avignon and to the University at Montpellier. And as a proud Tuscan growing up in a family full of memories of a noble family lineage in Tuscany, he resented the French and their ubiquitous cultural pride that made fun of his accented French (how things change!) and chaffed under the brunt of French cultural superiority. This experience led directly to Petrarch's later expression of Italian national pride both political and linguistic (see his "Italia Mia"). And this Italian pride was one of the most important factors in the origins of the Italian Renaissance itself. Much of the Italian Renaissance involved Italian pride annoyed by French assumptions of cultural superiority. We must remember that when Dante began writing in the late thirteenth century, any intellectual presuming to international fame and success would choose to write in French. "Italian" didn't even exist. The Italian language was nothing more than a gathering of noisy dialects. It is the work of Dante, Petrarch and Boccaccio who together establish the Tuscan dialect as "Italian" and do so with great pride and the conviction that this language is as good if not better than French. In 1320, Petrarch came "home." He came to the University of Bologna, one of the oldest and greatest of all the European universities. 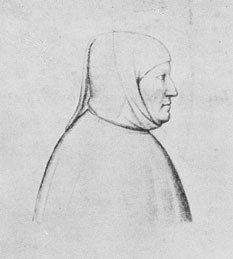 Petrarch came to Bologna to study law. And he hated it. When his father died in 1326, he and his brother Gherardo returned to southern France to attend to the estate and for the next twenty five years, Petrarch lived the life of the Italian exile enjoying the rich life of Avignon overrun with money and papal politics. In 1327, in the church of Santa Clara in Avignon Petrarch saw and fell in love with Laura. This encounter inspired him to write a series of small poems to her and about her and about love. These poems became part of Petrarch's most influential work, that which came to be called Il Canzoniere, the collection of hundreds of sonnets about love. In Italian, Il Canzoniere is also called Le Rime Sparse or The Dispersed Rhymes and then later all collected together into Il Canzoniere (The Songbook). Petrarch never realized that Il Canzoniere would be his most influential work. He was devoted to his Classical studies, to stories and histories of Rome and therefore always assumed that his great work was his imitation of Virgil in his Latin poem called Africa about the struggle for power between Rome and Carthage. Africa is almost never read now except by experts studying Petrarch whereas the poems collected together in Il Canzoniere may be the most influential collection of poetry written by any European after the fall of Rome. The influence of Il Canzoniere derives from its power with the form of the sonnet. Petrarch "invented" the sonnet for modern Europe. The origins of the sonnet can be found in the twelfth century in the world of Courtly Love and in the vast production of hundreds of Courtly Love poets. But it is the work of Petrarch and the sheer power and influence of his hundreds of sonnets collected in Il Canzoniere that established the form of the sonnet which is then discovered and imitated by poets who visited Italy and studied both the language and the sonnet form and carried this form back to their own country. This process is especially important for England. Sir Thomas Wyatt came to Italy in 1527 and studied Petrarch, translated him into English and carried the sonnet back to England. Henry Howard, Earl of Surrey, did the same thing and advanced the sonnet and revised it into the English form which later became the model for Shakespeare's own sonnets. The sonnet is a poem of fourteen lines. It is short and therefore seizes on one mood or one thought or one person to talk softly and gently of love and loving, love lost, love future, love past, love, love, love. Sonnets usually are written about love. The sonnet consists of fourteen lines that follow two rhyme patterns: a b b a a b b a called the Petrarchian pattern, or a b a b c d c d e f e f g g called the Elizabethan (Shakespeare). The sonnet usually has 10, 11, or 12 syllables per line. The sonnet is so familiar to us that it hardly seems conceivable that there could have been a time when it was not such a common poetic mode of expression. But this is the case and the creation of the sonnet as the most popular poetic form in the 15th and 16th and 17th centuries is due primarily to the work of Petrarch. And therefore it is extremely interesting to speculate about the unique quality of the sonnet that appeals to the age of the Renaissance whereas the vast encyclopedic work like the Divine Comedy falls out of fashion in this period. The appeal of the sonnet may have to do with the growing power of individualism in the Renaissance. In an age when individual character, individual even eccentric thoughts, individual uniqueness and personal interior feelings and thoughts, are of great interest to writers, the sonnet allows the writer to concentrate on himself, his thoughts, his feelings, to the exclusion of all else. It is a highly personal literary form. In the twenty five years between Petrarch's return to France and his final move back to Italy, he traveled incessantly. He visited popes, emperors, and kings. He went to Rome for the first time in 1337 and was powerfully impressed with the meaning and majesty of Rome. He bought a charming, small house in the Provence countryside in Vauclause near Avignon and wrote beautiful sonnets filled with the sounds and aromas of the country: of water and fountains and grasses and flowers. He extolled the life of the country far from the noise and the filth of the city and then he rushed back to the excitement of the city. It sounds all very modern doesn't it? In 1353, Petrarch returned to Italy and for the last quarter of his life he lived in Milan, Padua, Venice and other Italian cities, and he became the most famous writer alive. His poetry, his scholarly writings, his letters which were published, all established him as an international celebrity. And when in 1361 he went to Paris to receive the accolades of the King of France it is the mark of literary supremacy that suddenly an Italian is being lauded in Paris as the greatest of living literary figures. Petrarch observed in his own life a complete reversal of international linguistic fashion. When he was born, French was the premiere literary language. When he died in 1374, Italian was now the equal if not the superior of French. This reversal is due to the work of Dante, Petrarch, and Boccaccio. Petrarch's last years were happy and contented. He built a charming house in the hills south of Padua and his children joined him there (children all born out of wedlock, but all acknowledged and supported by Petrarch). His daughter Francesca joined him there with her own family and his last years were filled with the happy noise of grandchildren running around the garden and the laughter of friends who had dropped in for yet another wonderful dinner. The dinners would last into the late hours of the night with much wine and hilarious stories about Cicero and Julius Caesar. Above all Petarch was a writer. And here is Petrarch the writer recounting to us a wonderful moment at his desk: "I had got this far, and was thinking of what to say next, and as my habit is, I was pricking the paper idly with my pen. And I thought how, between one dip of the pen and the next, time goes on, and I hurry, drive myself, and speed toward death. We are always dying. I while I write, you while you read, and others while they listen or stop their ears, they are all dying." On a bright summer morning in 1374, on the nineteenth of July, Francesca went into her father's study and found him at his desk slumped over dead with pen just dropped out of his hand as he wrote his Life of Julius Caesar. Angelo Gianni, ed., pp. 450-451. English translation by William H. Fredlund. ragionando con meco; et io co' lui. a human footprint in the sand. that which is hidden from all men. and for me to respond. "Chiare, Fresche, e Dolci Acque"
Angelo Gianni, ed., pp. 464-468.
e torni l'alma al proprio albergo ignuda. coverta già de l'amoroso nembo. girando parea dir: "Qui regna Amore." "Costei per fermo nacque in paradiso!" "Qui come venn'io, o quando?" e gir infra la gente. to these my last, mournful words. and let my soul return to its home naked. flee from my poor flesh and bones. now covered in a shower of love's blooms. and seemed to say: "Here Love reigns." "For certain she was born up in Heaven!" "How and when did I come here?" and find no peace elsewhere. and make your way among mankind. Editorial note from William Fredlund: This letter was probably written in 1344 from Parma. At that moment, Parma was in the middle of a war of overlords with troops from Milan about to lay siege to the valuable city. The letter is noteworthy for a number of reasons. First, it documents the continuous wars that ripped Italy apart during the fourteenth century, wars that disturbed the minds of Italian thinkers such as Petrarch. The Florentine poet was deeply concerned about the fratricidal chaos that was weakening the political structure of the peninsula. Second, the letter makes it clear that contrary to much that has been written about the absence of a sense of Italian identity until much later (some say as late as the nineteenth century), here in 1344 one of the most influential Italian literary figures writes an unabashedly patriotic cry for Italian unity and Italian solidarity against the northern "barbarians." The clear evidence for this feeling changes how we interpret the period immediately before the Renaissance. It suggests that the Renaissance itself may have had at its core an intense Italian self-awareness that contributed to the radically new cultural movement that we now call the Renaissance. Petrarch was an "Italian;" he knew what "Italy" was; he wept over Italians killing Italians; and he dreamt of the day when Italy would be a unified entity. Here follows the text of Petrarch's letter now known as "Italia Mia:"
My Italy, although talking does not serve to heal the mortal wounds which I see so thick on your fair body, it pleases me at least that my sighs are such as the Tiber hopes for, and the Arno, and the Po, where I now sit heavy with grief. Ruler of heaven, I ask that the pity which led you to earth may turn you to your dearly beloved country: see , Gracious Lord, what cruel war springs from what slight causes. Open, Father, and soften and untie the hearts that fierce and haughty Mars harden and locks up. Make truth be heard there  whatever I may be  through my tongue. You, in whose hands fortune has put control of our fair country, no pity for which seems to constrain you, what are so many foreign swords doing here? [NB: Petrarch here refers to foreign mercenaries being used in the current wars.] Why is the verdant earth covered with the blood of barbarians? A vain error deludes you; you see little and think you see much, for you seek love or faith in venal hearts. He who possesses the most forces is most entangled by his enemies. O deluge gathered from what wild desert to inundate our gentle fields! If this happens to us by our own hands. Who will there now be to save us? I'll say nothing of Caesar, who on every shore where he sent our iron made the grass bloody from their veins. Now it seems  I know not through what evil star  that heaven has us, thanks to you to whom so much was entrusted. Your divided wills lay waste he most beautiful part of the world. What sin, what judgment, what destiny causes you to oppress your poor neighbor, and to pursue his afflicted and scattered fortunes, and to seek our forces in foreign countries and to be pleased that blood is shed and souls sold for a price? I talk to say the truth, not out of hatred or scorn of others. Petrarch’s Eight Years in Milan. Cambridge, Mass: Medieval Academy, 1958. Studies in the Life and Work of Petrarch. Cambridge, Mass: Medieval academy, 1955. Bloomington: University of Indiana Press, 1963.
material on the larger cultural context of his life and work. Mass: Medieval Academy of America, 1985. Hans Baron was one of the most influential scholars to write about the Renaissance since World War II, and thus a book by him about one of Petrarch’s most important works is itself noteworthy. This is an excellent introduction to the work of Petrarch. New Haven: Yale University press, 1970. Trinkaus takes up one of the most important issues in the study of Petrarch: to what extent did he contribute to the formation of Renaissance ideas and concepts. There is no doubt that he had an enormous impact upon the literary and historiographical thinking of later fourteenth-century Italy. But, how much? And in what way? These are fascinating questions and Trinkaus is a master of Renaissance literary history. An Anthology of Petrarch’s Letters. New York: Harper & Row, 1971. This is the best edition of the letters in English. It is based on the great James Harvey Robinson edition of the letters first published in 1898, but David Thompson has improved the translations and provided new translations of texts never before translated. Unfortunately it is now out of print so you will have to use the libraries or out-of-print search sources. Many of the letters are now on the web (go to the Petrarch index page here on motwm.com and click on “Letters”) in the Robinson translation. Musa, Mark, ed. and trans. Bloomington: University of Indiana Press, 1996. We all must be grateful to Mark Musa for his lifelong dedication to Italian literature and especially for this spectacular edition of Petrarch’s most important work of poetry. The Canzoniere, was a collection of poems written over a lifetime and then collected together by Petrarch. The collection had an enormous influence in the history of European poetry as the most accomplished collection of sonnets by any European author before Shakespeare. Everyone read the Canzoniere and all later writers of sonnets were influenced by what Petrarch did. Musa has given us this beautiful collection in a bilingual edition with Italian on one page and English on the opposite page. The translations are exquisite. For those who wish to understand Petrarch as a genius of poetry, this is the book to buy. Selections from the Canzoniere and Other Works. New York: Oxford World Classics, 1985. This inexpensive little collection of poetry and some prose is an excellent place to start one’s study of Petrarch. It has a good bibliography.